Once again, I’d failed to bring my own aluminum foil. ME: Could you please bring me a square of aluminum foil so I can take these home? WAITRESS: How about a box? ME: No, I don’t really need a box. A piece of foil will be fine. WAITRESS: I’m not sure I can do that. WAITRESS: Nobody’s ever asked before. ME: But this restaurant does have aluminum foil in the kitchen? ME (holding out my hands a few inches apart): Could you just tear me off a piece about this big? WAITRESS (returning with a gigantic Styrofoam container and handing it to me): Here you go. ME: Thanks, but I don’t want that. I’m anti-Styrofoam. (She stares at me, wide-eyed, and I feel the need to explain.) In the first place, it’s way more packaging than I need for these two little triangles of quesadillas. Plus, it leaks. It’s too big to fit in my refrigerator. And… (I want to avoid lecturing. Really I do. But I just can’t help myself. )… did you know that Styrofoam can’t be recycled? And that if it’s put in a landfill, it will take at least 50 years to decompose? WAITRESS (snatching the container back and turning to leave): Ummm…okay. ME (addressing my lunch companions): Sorry. WAITRESS (returning and handing me a round foil pan with a cardboard lid): Will this do? ME (sighing, but not loud enough for her to hear, I hope): Great. Thank you. So here I was, lunching at Cheddar’s again with the same group of girlfriends, and nothing in my purse to hold my leftover quesadillas. Our waitress, Tatum, had thus far proved to be wonderful. She didn’t slide into the empty spot in our booth and say “How are we doing today?” as though she were our new best friend. She didn’t refill tea glasses, a pet peeve of one of my dining companions who’s very particular about how much ice and lemon she has in hers, without asking. She acknowledged that one side of the soft drink fountain tended to dispense Cokes that tasted funny and promised to report the problem to the manager. 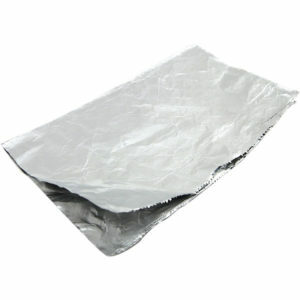 Best of all, when I asked her for a square of aluminum foil in which to wrap my leftovers, she brought me one. No questions asked, no discussion necessary. Thanks, Tatum. I sure hope they seat me in your section next time I eat at your place.